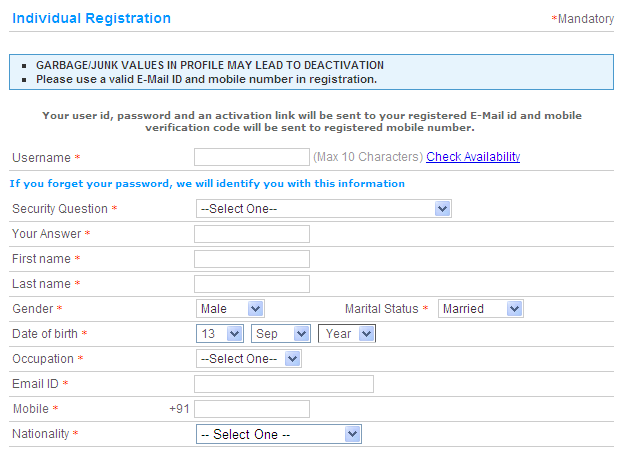 Registration/creating or signup of new IRCTC account is really easy. In case you are fresh to online train ticket booking, then you will definitely need an IRCTC account to book seats. You should provide only genuine information while create new account otherwise you are account will be removed and you can maintain only one authorized IRCTC account. Maintain a IRCTC account is incredibly beneficial, it is going to save your time and you can book tickets quickly as per your requirement. Using a IRCTC account, you can check seats availability within a train, cancel your tickets. You can create a new IRCTC account very easily by following steps below. Between 7 AM to 11 AM, IRCTC won't allow you to register. 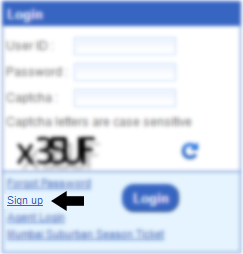 Go to www.irctc.co.in , Click on "Sign Up". As you go through the registration form, be careful while filling the form any incorrect data may lead to deactivation of your account. Hence always keep your account updated with correct details and also provide correct details during registration. Most importantly use a valid E-mail ID and mobile number in IRCTC registration form. As your User ID, Password and activation link will be sent to your provided E-mail ID and mobile verification code will be sent to your provided mobile number. Red star marked fields are mandatory to full but you can skip the fields which are not marked with red star. First you need to choose a username for your account, your username should be between 3 - 10 characters. As you put your username on the field, then just click on Check Availability link to check whether the username you choose is available or not. If it is not available, then try another username. And make sure that, choose the username which you can easily remember because you always need it to login to your IRCTC account. Now select a security question and give it answer. In case if you forgot the password, you can recover it by using security question. Next go through all the personal details and enter them properly. Now enter your Address details, don't give any fake address as you book I-ticket through IRCTC account they will send the tickets through courier to the address provided. Although you can provide a different address at the time of ticket booking but it will help you to book tatkal tickets faster. If you have provided correct address, you don't need to enter address all time when you book tickets. Other services is the last section of IRCTC registration form. This is completely optional and depends upon your interest, as at this section you can subscribe to special offer, commercial, promotions and newsletters through E-mail or SMS on mobile. You can click on No option to unsubscribe. After filling all the sections, enter the verification code as given in the image. If you are unable to understand the code properly you can use refresh button to get a new code on IRCTC registration. After clicking on submit button a pop up will appear, it shows your E-mail ID and mobile number, if the entered email id and mobile number are correct click OK button to proceed further. Now you will be go through Terms and Conditions page, click on Accept button to continue the registration process. A registration completion message will be displayed once after you accept the terms and conditions. Check your E-mail account and mobile, which you have provided while registering for IRCTC account. You will receive your account password to your E-mail. Click on the activation link in your email or log in to IRCTC website. Enter your mobile verification code received through SMS and click on submit button to activate your new account. If you haven't received the mobile verification code, click on first "Click Here" link. To update your registered mobile number if you entered wrong mobile number at the time of registration click on second "Click Here" link. If you received so many messages with different mobile verification codes, use the recent verification code to activate your IRCTC account. When you finally verify your own e-mail account and mobile, your IRCTC new account signing up procedure is actually completed. Now if you want to change the password, you can change it by going through "Change password" link. Done! Your IRCTC account registration is complete, now you log in to your IRCTC account and book tickets, check availability of trains. Even you can book tatkal tickets through online. I compeleted the registration process. But it was not successful as it showed that my mobile no is already used. So how to ovrcome this? Please suggest.